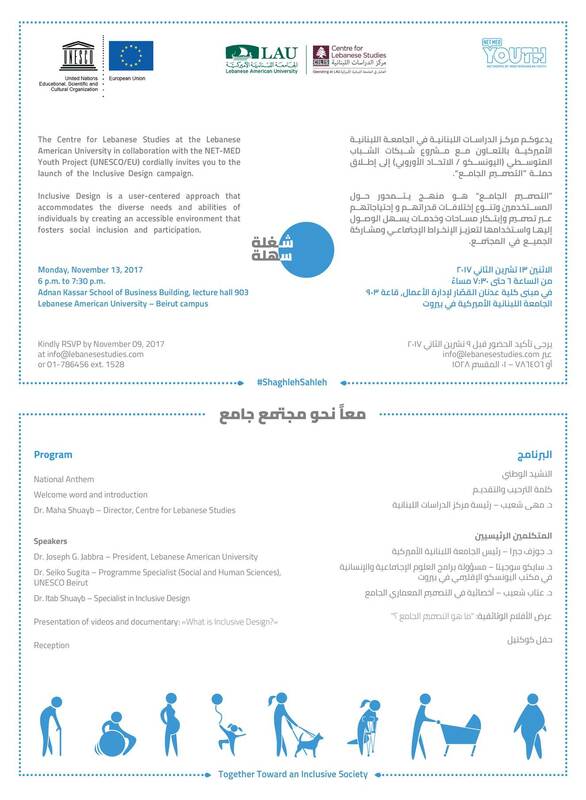 The Center for Lebanese Studies (CLS) at LAU, in collaboration with the NET-MED Youth Project (UNESCO/EU), is hosting the launch of “Inclusive Design” campaign. Inclusive Design is a user-centered approach that accommodates the diverse needs and abilities of individuals by creating an accessible environment that fosters social inclusion and participation. For more information on the event’s program, kindly click here. Kindly RSVP by November 9, 2017 at info@lebanesestudies.com or 00961 1 786 456 ext. 1528.